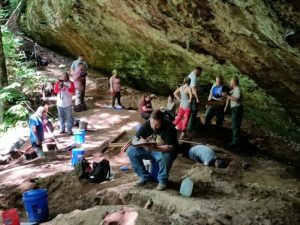 My aim here is to share some of the insights I gained during the course of the 2016 EKU field school in Daniel Boone National Forest and, in particular, how and why my approach to teaching field school has changed. In the interest of full disclosure I never attended an archaeological field school so I have no experience from the student’s perspective. My training in archaeology was on-the-job as a volunteer and field technician working in cultural resource management. I’ve only been on the instructional side as a teaching assistant at the University of Florida field school and as a faculty member at EKU. Now that I have taught four field schools and witnessed how others are run, I’ve come to reflect on what my approach has been, how it’s changed, and what the results of the changes are. The first three field schools I taught were at White Hall State Historical Site (2012-2014). In terms of course structure, field school was four credit hours, lasted four weeks, and was almost entirely “in the field.” Lab work was restricted to rain days and the last day or two of field school. 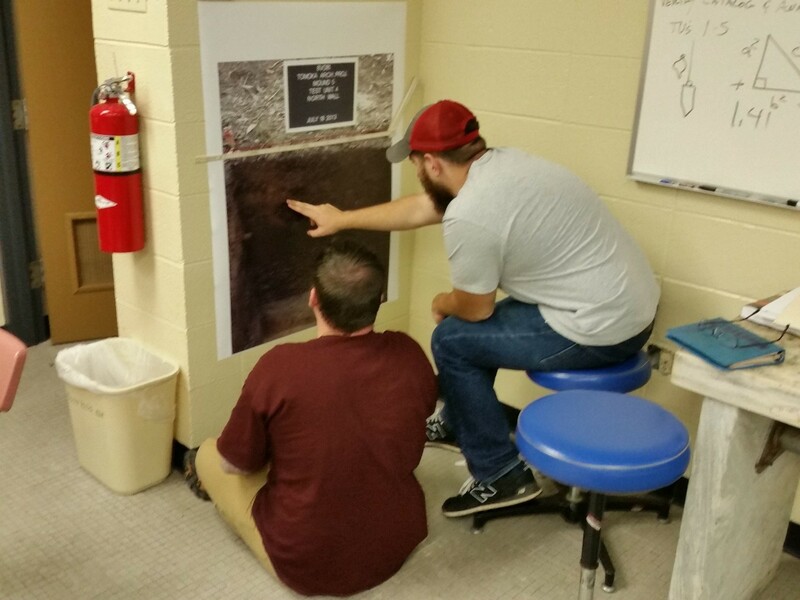 Although I enjoyed the shortened summer teaching schedule, I found myself with a gargantuan backlog of unprocessed materials and used every opportunity to get those materials processed during the fall and spring semesters as part of my archaeology courses. In fact, only recently (April 2016) was the sorting of the 2012-2014 field school materials completed. Entering the information into the catalog and writing the report remains, however. 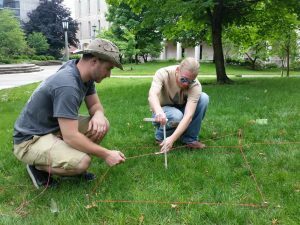 I did not teach a field school in 2015 because I had mapped and tested White Hall to the point that further work would just be digging only for the sake of digging – I had shovel tested, mapped, and tested all the structures present within the park. So after some reflection on my experiences teaching field school during this hiatus I arrived at two basic conclusions. 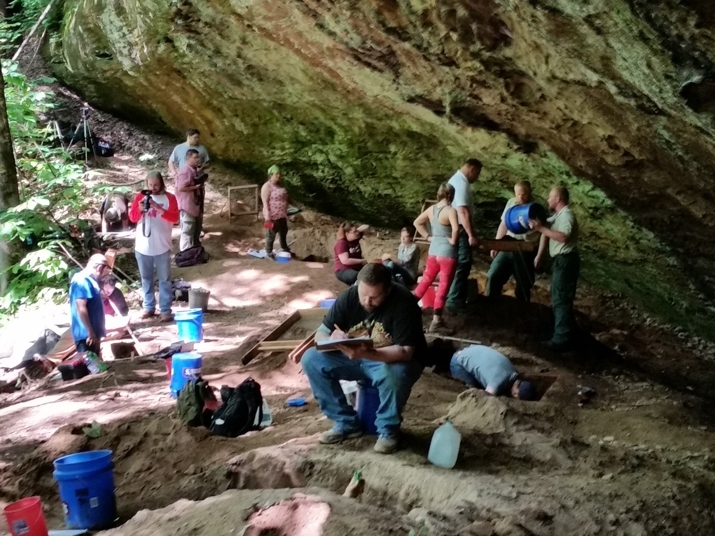 First, four weeks is not enough time to teach a field school. It felt rushed and teaching students methods on the fly in the field was an ongoing exercise in damage control. And then there was the inevitable mountain of unprocessed materials after each field school since there wasn’t really any time to process and catalog them. Second, everybody is better served by offering methods instruction before entering the field. Addressing these observations led to three substantive changes. First, lengthening field school to six weeks and increasing it accordingly to six credit hours. Second, dedicating one full week at the beginning to instruction and practical exercises designed to develop competence in basic archaeological methods: subsurface survey, establishing site grids, setting up excavation units, mapping and profiling unit floors and walls, filling out paperwork, etc. 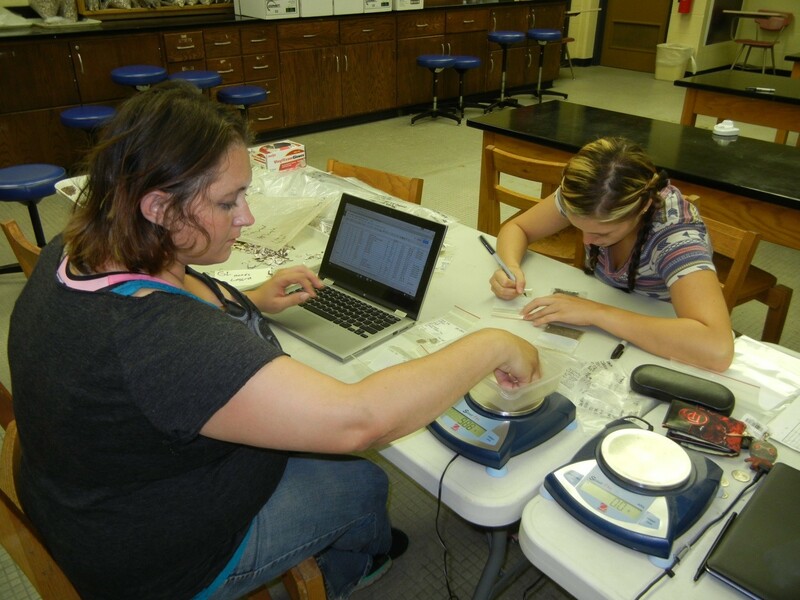 Third and finally, one full week at the end of field school was dedicated to laboratory work. These changes yielded significant and positive results that were apparent to the students and myself. It became abundantly apparent that pre-field classroom instruction coupled with skill-building activities provided students with a solid, practice-based skill set that allowed students to carry out the majority of basic tasks without the need for a lot of explanation. Naturally some clarification or minor direction was necessary, but largely students were able to perform basic archaeological activities on their own. Students reported feeling confident in what they were doing while in the field as a direct result of instruction and skill-building activities. Long story short – students felt prepared and that was manifest in their performance which I judge as outstanding. Devoting an entire week to laboratory work also yielded positive results. 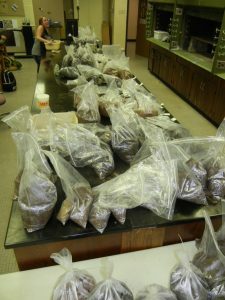 Nearly the entire surface of the 20 ft. x 5 ft. counter in the EKU archaeology lab was covered with artifact bags, feature fill, column sample, and flotation samples. In a day and a half, all of the artifacts were washed. By the third day of lab week cataloging had begun. I created an Excel spreadsheet in Google docs and had between one and three students cataloging simultaneously. By the end of lab week we were running like a well-oiled machine – materials being cataloged immediately after sorting was completed. With the exception of the bulk sediment samples for flotation, field school students processed, sorted, and cataloged nearly everything we recovered during our four weeks in the field. Alone this is a monumental improvement. Maybe the changes I implemented seem like common sense, and I suppose it is, really. But tradition and “standard operating procedure” can be tough to break out of. I trained students the way I was trained and I ran field school the way I saw field schools run. However, when confronted with obstacles and impracticalities that came directly out of my own routinized practices it was hard to fall back on “tradition” as justification for continuing on as before. The results of some simple changes were far better than expected and I plan to keep them in future field schools and continuing to find ways to improve. The week of instruction and skill-building activities at the front end and the week of laboratory work at the end have made a world of difference in student learning, confidence, competence, and performance in both the field and laboratory. 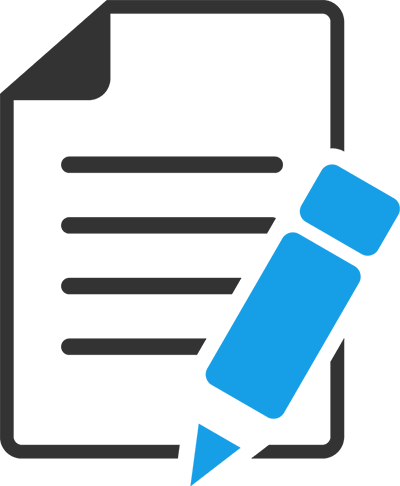 Although it is two weeks of extra work for me, it ultimately saves time and effort in the long run. But more importantly, students learned more, learned more deeply, and felt confident in their knowledge and abilities – that’s something for which I’ll gladly surrender two weeks of my summer.